Imagine a product that would help manage your contacts, keep you organized, and enable you to leverage the power of the internet all in one place. 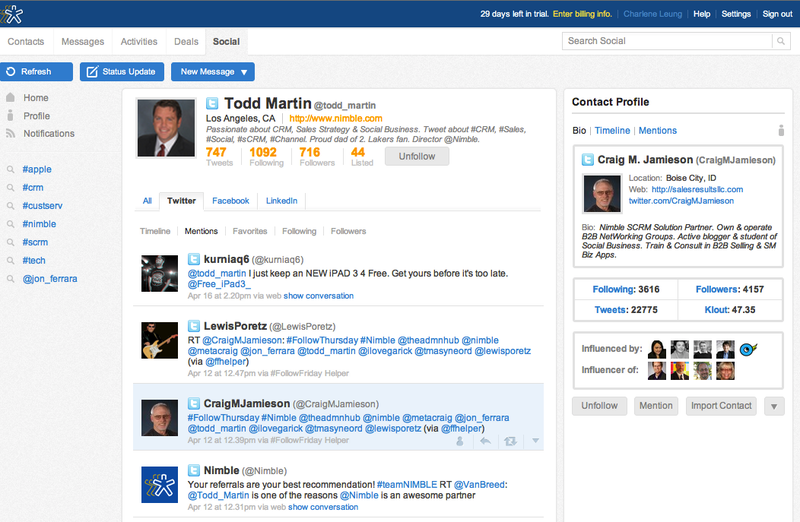 Nimble is a CRM platform that has social media at its heart. Most CRM systems focus on Customer Relationships and ignore all the other relationships that also drive business success. Friends, family, classmates, colleagues, partners and even complete strangers also positively impact sales in a small business. To capture these relationships, Nimble unifies all of your contacts, your Gmail or Outlook email, calendar activities and the most popular social channels (Facebook, Google+, Twitter, Instagram, AngelList and LinkedIn) in one easy-to-use, Web-based solution. Designed for small and medium-sized businesses, Nimble is the next evolution in CRM - a simple, yet powerful social relationship manager that helps companies leverage all of their relationships to become more productive and profitable. Unlike many CRM products available today which are costly and complex, Nimble is lean, clean and easy to use - but it has the power and flexibility to scale and grow with you. Twitter Widget – View a snapshot of a contact’s Twitter profile. Twitter can feel like an overcrowded waiting room. There are lots of people talking about a variety of topics. How do you find the right people to connect with from a sales and marketing perspective? How do you engage them in conversation? And how do you convert them into leads and customers? Find out in this eBook! Nimble is the only solution on the market that unifies the "4Cs" - Contacts, Calendar, Communications and Collaboration. Nimble puts all of your contacts, tasks, events, emails and the most popular social streams (LinkedIn, Facebook and Twitter) in one single place. This allows you to easily see all of the communications you and your teams have had with your contacts, no matter where those conversations take place, and without having to jump from window to window, tab to tab, network to network or application to application. There is no attempt to draw your customer, partner, vendor or prospect into yet another service, instead Nimble integrates with whatever social media services they are already on and pulls all of their information, posts, tweets, etc into one screen. Contact Record View – View core contact information, and all activities, emails, notes, deals, and social conversations related to that contact, in one clean and simple screen. Nimble helps your business find and listen to social conversations, and identify relevant business contacts, people who are engaged and looking for what your business has to offer. Social View – Drill down to a particular contact in Nimble to view all his social streams from Facebook, LinkedIn, and Twitter. Nimble also automatically searches social media sites, identifies interested prospects and ranks those individuals according to their business potential. Once key information is identified, fully integrated collaboration tools allow you to share that information among those who need it most. And this was done without forgetting that traditional elements of CRM are still going to be required. Therefore, while modern in design, there is still a structure to it that makes complete sense to a sales professional and helps you accelerate your sales, marketing and support processes. 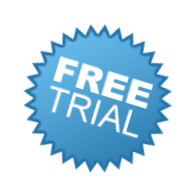 As a small company, you can realize all of the benefits of Nimble for one low monthly subscription. Since Nimble is a Web-based solution, there is no costly IT infrastructure or yearly maintenance contracts – you simply import your contacts and you’re off and running and you can rest assured that your information is always accessible, no matter where you happen to be. Nimble is the next evolution in relationship management - a social relationship manager that makes it fun and easy to nurture personal and business relationships. 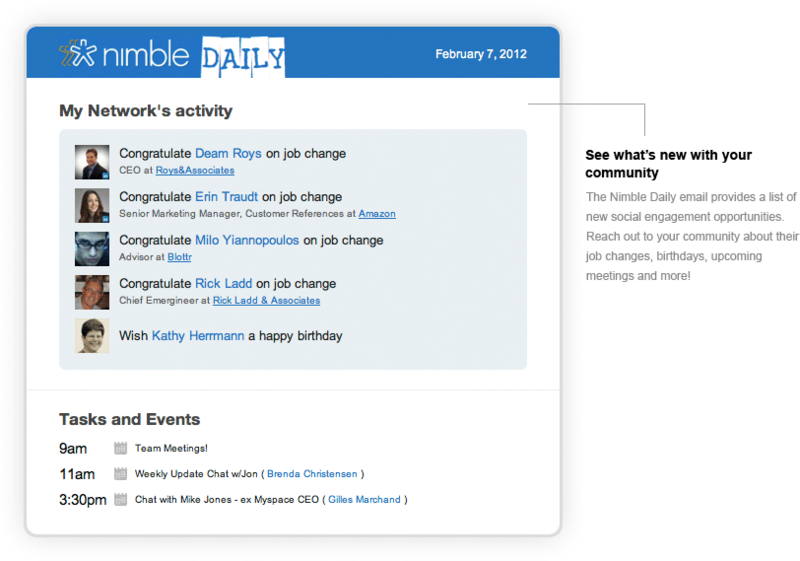 Daily Email – The Nimble Daily email notifies you of job changes, birthdays and all your scheduled activities. Easily click to the contacts’ records to congratulate them on any of these events. Easily connect all of your contacts, calendars, communications and social conversations. Listen to and engage any individual in order to attract and retain the right customers. 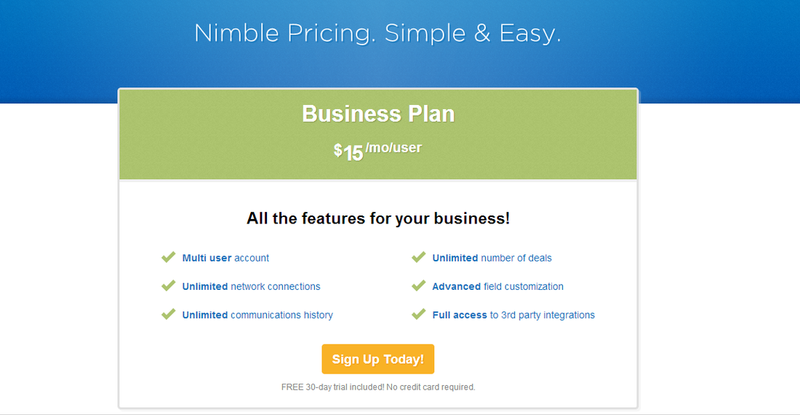 Nimble Personal (free plan) is also available (single user, 5 deals, 1GB storage, 3K contacts).